Snohomish PUD and others are opposing privatization of federal hydropower systems. EVERETT -- The White House wants to sell off the Bonneville Power Administration and other hydropower systems throughout the country, moves critics warn would push up electricity rates for consumers in the Pacific Northwest and beyond. The plan from President Donald Trump also would change the way Bonneville Power sets its rates. 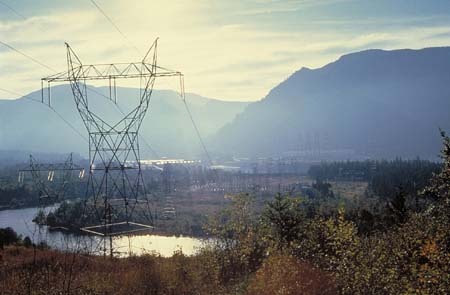 The Snohomish County Public Utility District buys about 80 percent of its electricity from Bonneville Power, which was created by the federal government in the 1930s. It's one of four power marketing administrations that deliver and sell hydro-electric power from federal dams to much of the country. "Selling off BPA's transmission system and abandoning cost-based rates would raise electricity rates and throw sand in the gears of the Northwest economy," said Sen. Maria Cantwell, D-Wash., in a statement. "Northwest consumers already cover the full costs, with interest, of building and operating our region's hydropower system. I will be working with all my Pacific Northwest colleagues to once again stop this bad idea in its tracks." The issue is in the senator's wheelhouse; Cantwell is the ranking Democrat on the Senate Energy and Natural Resources Committee. Unloading the Pacific Northwest's major power purveyor is one of thousands of ideas in the annual budget the Trump administration released Monday. It's part of a broader push by the president and his allies to privatize federal infrastructure in the name of free-market efficiency. The Tennessee Valley Authority, Southwestern Power Administration and Western Area Power Administration also are targeted for divestment. Getting the federal government out of the power-transmission business, "would encourage a more efficient allocation of economic resources and mitigate risk to taxpayers," the budget document contends. The administration also favors letting BPA and its counterparts charge market-based rates like for-profit utilities, "rather than being limited to cost-based rates." By privatizing BPA, the federal government could save nearly $5.2 billion by the end of 2028, the president's budget estimates. Further savings are projected from rate changes. An industry group for Pacific Northwest utilities, including the Snohomish County PUD, issued a statement opposing the privatization plan. "The bottom line is this budget proposes to raise an extra $5 billion to $7 billion on the backs of Northwest electricity customers over the next 10 years without any added benefit," Public Power Council executive director Scott Corwin said in a statement. "We are looking to the future, and are already working with BPA to modernize its transmission system and to take concerted action to address its cost of power." Charging market electricity rates could conflict with BPA's statutes and interfere with long-term contracts already in place with local utilities, the group cautioned. Other concerns about divestment include neglect of rural areas and a less reliable power grid. The president's spending plan is only the first step in a long process. It's now up to the House and Senate to pass their own versions of the federal budget. The 2019 fiscal year begins Oct. 1.